← Eagleton in Iowa: Is 2016 the Last 1st in the Nation Iowa Caucus? The Rutgers-Eagleton Poll is back with its latest round of results, and first up is the newest numbers on Gov. Chris Christie. Not a whole lot has changed since we last polled the governor in August. He received a few point bump this time around in his favorability and job approval, but the numbers nonetheless still paint a worrisome picture for the governor. His favorability has bottomed out in the 30s since February; his job approval followed right along with it in August. And no specific issues garners him anything close to 50 percent except for Sandy – though even this issue is a far cry from the near unanimous support Christie once received for his recovery efforts post-superstorm. Not to mention, NJ voters are still pretty unhappy with the state of the Garden State, a type of negativity we haven’t seen since October 2009. NEW BRUNSWICK, N.J. – Even a potential hurricane last week could not give Gov. Chris Christie much of a boost in his home state, where voters continue to feel largely negative toward him and the job he is doing, according to the latest Rutgers-Eagleton Poll. 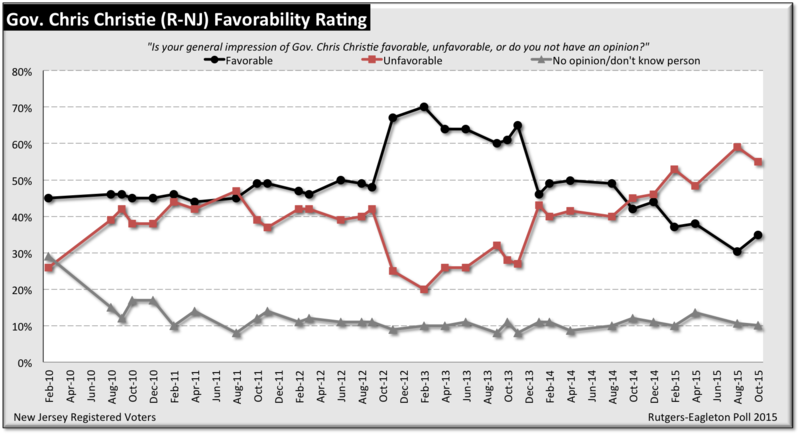 Thirty-five percent of New Jersey registered voters have a favorable opinion of Christie; while up five points from August, this is still the second lowest rating he has ever received. Likewise, while unfavorable ratings have improved by four points, 55 percent remain negative toward the governor. Voters in the Garden State have been consistently more unfavorable than favorable toward him since October 2014. 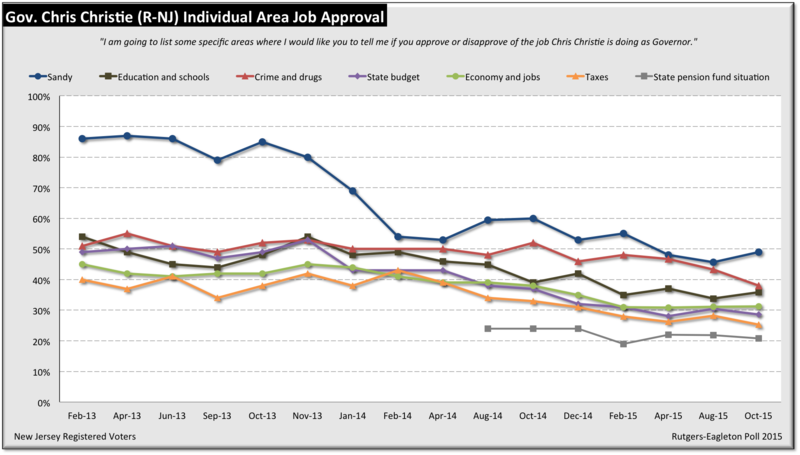 Similarly, Christie’s overall job approval is not significantly different from August when it hit bottom; 39 percent now approve (up two points), while 56 percent disapprove (down three points). A majority has consistently disapproved of the job Christie is doing since February 2015. Christie fares no better on individual issues. His rating on the perennially top issue of taxes continues to fall – just 25 percent approve in this latest poll, while 66 percent disapprove. Voters continue to ding Christie on other issues, with performance on crime and drugs falling to 38 percent approve, 44 percent disapprove. Approval on the economy and jobs remains strongly negative at 31 percent approve, 58 percent disapprove. He continues to draw substantial disapproval for his efforts on the state budget (29 percent approve, 59 percent disapprove), the state pension fund situation (21 percent approve, 63 percent disapprove), and education (36 percent approve, 57 percent disapprove). Sandy is the only issue where Christie’s ratings are positive, though voters are closely divided – 49 percent approve to 42 percent disapprove. This is the issue on which Christie has taken his biggest hit given that he commanded well over 80 percent approval on Sandy recovery through most of 2013. Negativity toward Christie seems to go hand in hand with perceptions of the overall state of the Garden State, with 61 percent of voters now saying New Jersey has gone off on the wrong and just 32 percent saying it is going in the right direction. This is a complete reversal from two years ago, with such strong negativity not felt since October 2009. Results are from a statewide poll of 935 adults contacted by live callers on both landlines and cell phones from October 3 to 10, 2015, including 781 registered voters reported on in this release. The registered voter sample has a margin of error of +/-3.9 percentage points. Interviews were done in English and, when requested, Spanish. Despite gains in the last two months, Christie continues to receive lackluster ratings from Garden State voters. His Republican base is a bit more positive than in August, with 68 percent now having a favorable impression of the governor – though this is still far from the near-unanimous party support he received pre-Bridgegate. Views toward the governor among Democrats are relatively steady at 14 percent favorable, 81 percent unfavorable. Independents have rebounded to where they were in April, at 36 percent favorable; 49 percent of independents are unfavorable, down 10 points since August. Likewise, 71 percent of Republicans continue to approve of the job Christie is doing as governor, compared to just 16 percent of Democrats (down three points since August). Independents are much less negative and much more split than they were two months ago: 42 percent approve (up eight points) to 49 percent disapprove (down 13 points). Christie’s report card has also changed little since August. When asked to award the governor a letter grade, more voters than ever now give Christie an F, at 28 percent. For the second time in the past year, just 5 percent give him an A – the lowest number of top grades Christie has received since taking office. Twenty-two percent now give Christie a B, 26 percent a C, and another 18 percent a D.
Just 1 percent of Democrats give Christie an A, while 43 percent fail him. Though just 4 percent of independents give Christie an A, the rest of this group is spread out more evenly among the remaining letter grades. Republicans are the only group, besides those favorable toward Christie and those who approve of the job he is doing, whose number of As reaches double-digits. Twelve percent of Republicans award him this top grade, while another 42 percent give him a B; but Christie still gets a D or F from 23 percent of his base. New Jersey voters, who often cite taxes as one of the most important problems in the state, have consistently given Christie some of his lowest scores on this very same issue, beat out only by his even lower approval on the state pension fund situation. Christie garners more approval than disapproval on taxes only from those who are favorable toward him and those who approve of the job he is doing overall, but even among these groups he does not reach a majority; exactly half of each approve of his job on taxes. Republicans continue to turn against Christie on taxes: 45 percent approve of his approach, while 51 percent disapprove. Just 12 percent of Democrats (down eight points) and 26 percent of independents (down four points) approve Christie’s job in this area. Women (at 71 percent) and non-white voters (at 77 percent) especially disapprove of Christie’s handling of taxes. Those in households making $150,000 or more annually are slightly more likely to approve of Christie on this issue than those in less affluent households. Approval on the economy and state budget show similar patterns. While solid majorities of Christie supporters approve of his job in these areas, Republicans are still not fully in his corner for either; 50 percent approve and 42 percent disapprove of Christie on the economy, while 50 percent approve and 36 percent disapprove on the state budget. Voters who identify as conservative are likewise split at 44 percent approve to 41 percent disapprove on the economy and 44 percent to 43 percent on the budget. No other group comes anywhere close to majority approval. Christie does worse on the state pension fund situation, failing to gain majority approval even from those with a favorable impression of him or those who approve of the job he is doing overall. Republicans are split on his handling of the issue (39 percent approve, 42 percent disapprove); just 8 percent of Democrats and 23 percent of independents approve Christie’s job in this area. While voters’ views on the direction of New Jersey have been more negative than positive since March 2014, dissatisfaction in the last six months has reached a level rarely seen in the past 25 years, paralleling growing displeasure with Christie himself. The only groups where majorities believe New Jersey is heading in the right direction are those most supportive of the governor: Republicans (at 54 percent), those with a favorable impression of Christie (at 60 percent), those who approve of the job he is doing overall (at 62 percent), and those who approve of the job he is doing on several individual issues. Large majorities of all other groups share a more negative outlook on the Garden State, with some of Christie’s usual detractors being the most negative. A solid majority of independents and especially Democrats believe New Jersey has gotten off on the wrong track, at 60 percent and 71 percent, respectively. Similar numbers of liberal and moderate voters feel the same, as do even half of voters who identify as conservative. Women are slightly more negative toward New Jersey’s direction than men: 64 percent of women, but only 57 percent of men say the state is off on the wrong track. Non-white voters are similarly a bit more pessimistic than white voters, 65 percent to 59 percent. Those in higher income households are a few points more positive than their lower income counterparts. Exurbanites and shore residents –usually more favorable toward Christie – also have a somewhat more positive outlook on New Jersey than those living in other areas, though a majority of voters in all regions say the state is on the wrong track.